MAS are a small size herding dog, developed in the United States and derived from the Australian Shepherd. This is a highly versatile, energetic dog, an athlete with superior intelligence and a willingness to please those to whom he is devoted. The Australian Shepherd, from which the MAS is derived, originated in the mid-1800’s on the ranches of south-western America. 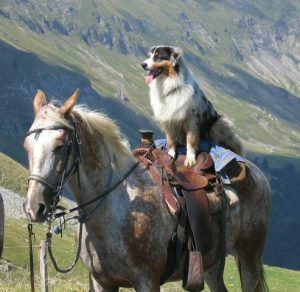 Over many years the ranchers interbred a variety of herding breeds and types to create a stockdog with the exacting traits required; a versatile, intelligent drover and guard, capable of moving stock long distances over a wide range of terrain through an equally wide range of weathers. Recognition: The Australian Shepherd is a comparatively new breed to the UK, with the first imported in 1986. Aussies were initially entered on the KC Working and Obedience Trials register (now the KC Activities register) before entering the Import Register in 1995, and approval for the interim Breed standard was gained. Full KC recognition was achieved in January 2000 and Championship Ticket status (CC) in 2006. During the 1960’s the Miniature Australian Shepherd was developed by selectively breeding smaller sized Australian Shepherds. These dogs were bred with a goal of maintaining the qualities and character of the larger dogs, in a smaller package. The ‘Minis’ have been used for herding smaller stock such as sheep and goats. Their smaller size made them excellent travel companions for equestrians travelling to horse shows and rodeos. Registration: The Miniature Australian Shepherd was first registered with the National Stock Dog Registry in 1980. By the early 1990’s, they had attained nationwide popularity. Several clubs promoted these small dogs, as they were registered and shown with various rare-breed organisations. 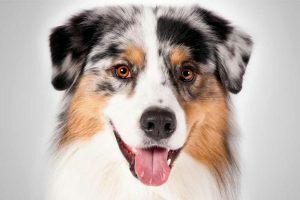 The Miniature American Shepherd entered the AKC Foundation Stock Service as a separate breed in their own right with the new name of the ‘Miniature American Shepherd’ in May 2011. The MAS is a working breed, placed in the Herding Group in the AKC. Today the MAS is established worldwide as an eye catching, versatile little herding dog. The Miniature American Shepherd Club of the USA (MASCUSA) is the designated national parent club and registry of the American Kennel Club. Recognition: Although not currently recognised by the Kennel Club in the United Kingdom, all MAS in the UK are registered with the American Kennel Club (AKC). A large number of European countries now recognise the MAS – with the list continually increasing.